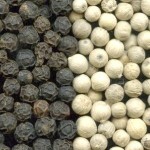 Black pepper is a tropical twining plant from southern India. 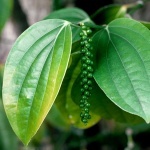 At one time Goa was the major exporter, but now black pepper is grown in all South-East Asia. The upper photo on the left shows a pepper plantation in Malaysia. The small fruits are green at first, then red, and black at last. When the half-ripened fruits are harvested and dried, 'black pepper' is obtained with the dried, wrinkled skin (flesh) surrounding the seeds. When the ripe fruits are harvested and the skin removed, the naked seeds or 'white pepper' is obtained. The unripe, green peppers may be pickled in brine or vinegar. The pepper seeds contain a volatile oil and the non-volatile compound piperine, the latter being responsible for the burning effect on the mucous membranes. Pepper oil has a fresh, sharp-woody and piquant odor. 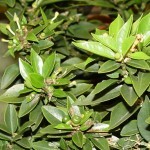 It is dominated by cyclic terpenes and sesquiterpenes. Beta-caryophyllene (33 %), 3-carene (22 %), d-limonene (19 %), beta-pinene (9 %) and alpha-pinene (4 %) are typical major constituents . However, a number of odor-intensive pyrazines, e.g. 2-ethyl-3,5-dimethylpyrazine (also known from cacao) and 3-ethyl-2,5-dimethylpyrazine, present in low concentration, also make a contribution to the odor . Moreover, aroma analysis has shown that oxygenated sesquiterpenes like (-)-cubenol and a number of phenol ethers such as asaricin play a role too . Piperine, the hot principle of black pebber, is present in the seeds in fairly large amounts - normally from 6 to 9 %, but sometimes up to 15 % (dry weight) . 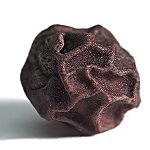 Milligram-for-milligram it is only about one percent as hot as capsaicin from Chile peppers . 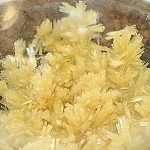 Piperine is easily isolated - the last photo shows crystals of pure piperine. It has a number of interesting medicinal properties. Pepper oil recently has had a revival in perfumery, especially in masculine perfumes. The spicy-aromatic and musky men's perfume Extreme Polo Sport (Ralph Lauren 1998) uses as much as 6 % pepper oil . The genus Piper has many members, several of which are utilized, e.g. long pepper, cubeb pepper, betel pepper, ashanti pepper and kava. Etymology: Lat. piper, from Sanskrit pippali. The word 'pepper' has been used figuratively meaning 'energy', as in 'pep talk'. Several non-related species used as spices are also called peppers, e.g. Chile pepper, Cayenne pepper, pink pepper, Sichuan pepper, Tasmanian pepper. Sometimes 'white pepper' has a rather disturbing faecal by-note. It turns out that unfavourable (anaerobic) conditions during the moist fermentation process used to remove the skin may give rise to skatole (3-methylindole) and other off-flavours . 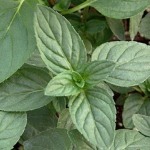 Peppermint is a crossing between water mint, M. aquatica, and spearmint, M. spicata. The oldest descriptions are from the end of the 17'th century, and probably the crossing has occurred in England and was discovered there. 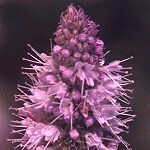 Peppermint oil is obtained by steam distillation of the flowering herb. It is an almost colourless to pale greenish-yellow liquid with a characteristic peppermint odour. The leading producer of peppermint oil is USA, where the annual production from M. piperita var. vulgaris is ca. 2000 t. Cultivation areas are located in the Midwest states Idaho, Oregon and Washington. Peppermint oil is used mainly for flavouring toothpaste, other oral hygiene products, and chewing gum. Smaller quantities are used for flavouring confectioneries. Japanese peppermint oil is obtained in the province of Yakima from M. arvensis var. piperescens. The main component of peppermint oil is (-)-menthol (ca. 50 %) followed by (-)-menthone (ca. 20 %) and (-)-menthyl acetate (ca. 10 %). A characteristic of peppermint oil is the high content of (+)-menthofurane (ca. 3 %, sometimes much higher) and a number of specific sesquiterpenes, one of them viridiflorol. The mint oils are among the most thoroughly investigated essential oils  . The menthol molecule carries three asymmetric carbon atoms, and therefore exists in four diastereomeric pairs. 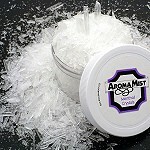 (-)-Menthol is the only isomer having the special cooling effect upon the mucous membranes. (-)-Menthol forms large, transparent, colourless, tinkling, prismatic crystals with a melting point of 43 °C (picture on the right). Today it is synthesized from a number of terpenes using stereospecific hydrogenation catalysts based on rhodium(I)- or ruthenium(II)-complexes (Knowles and Noyori in 2001 got The Nobel Prize in chemistry for their research in asymmetric synthesis using these catalysts). Peru balsam is obtained as a viscous resin from cuts in the bark of Myroxylon pereira, a tree of the pea family (fruit shown). 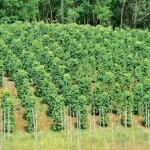 It is produced almost exclusively in El Salvador. 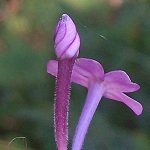 The balsam itself (picture) is not used anymore because it is allergenic. 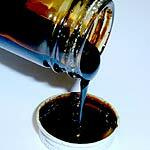 Instead the so-called Peru balsam oil is used, made by vacuum distillation of the balsam. 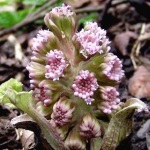 Common butterbur is native to Europe and northern Asia where it thrives in moist areas. 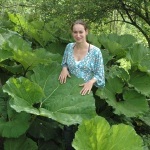 It is a robust herbaceous plant with thick underground rhizomes and large rhubarb-like leaves. The flowers appear before the leaves in early spring. The sap from freshly broken stalks of P. hybridus emits a strong and characteristic smell of dodecanal (or lauric aldehyde) . Pure, synthetic qualities of this fatty aldehyde are used in traces in perfumery for "fresh laundry"-like effects. 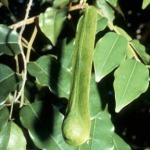 The rhizomes of P. hybridus are rich in sesquiterpene derivates of medicinal interest. Thus petasin (and isopetasin) is effective against migraine . 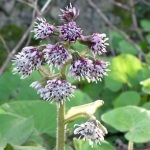 The closely related P. fragrans or "Winter Heliotrope" (last photo, kindly supplied by www.ukwildflowers.com / Peter Llewellyn) has been introduced to Europe from North Africa. It is a much smaller plant with kidney-shaped leaves and fragrant flowers in early springtime (Northern Europe). They are conspicuous from a distance because of their very sweet smell, dominated by anisaldehyde . Petitgrain oils are obtained by steam distillation of the leaves of Citrus species. The largest production takes place in the South American state of Paraguay from the leaves of an acclimatized variety of the bitter orange tree, Citrus aurantium subsp. amara. Petitgrain oil Paraguay has a characteristic, strong, bitter-sweet, citrusy odour with floral and woody nuances. (-)-Linalyl acetate and (-)-linalool in the proportion 2:1 make up about 80 % of the oil, but a great number of trace constituents, a few of which are shown, contribute to its special character . Petitgrain oils are used in Cologne and fougère type perfumes, and in perfumes for soaps, shampoos, etc. An example of a perfume with a recognizable petitgrain top note is Azzaro pour Homme (Azzaro 1978). 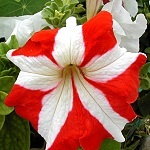 The Petunias are closely related to tobacco (Nicotiana). P. axillaris with white flowers and long flower tubes (first photo) and P. integrifolia (second photo) are both from Argentina. Their hybrids, P. x hybrida, come in multitudes of colors (lower photos). In the summertime they are seen everywhere in gardens and window boxes. 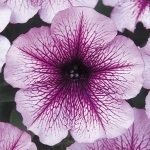 Benzenoids dominate the fragrance of petunia flowers. In the last decade P. x hybrida has emerged as the model of choice to study volatile benzenoid and phenylpropanoid synthesis, emission and regulation. These volatiles are synthesized predominantly in the corolla limb and emission is highly regulated, with a circadian rhythm, during corolla development, pollination and senescence . 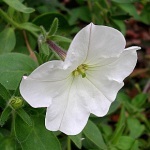 large white flowers that produce a pleasant fragrance, and found that mature flowers release benzaldehyde, phenylacetaldehyde, methyl benzoate, phenethyl alcohol, isoeugenol and benzyl benzoate as the major components. The emission has its maximum at dusk and seems to be regulated at the transcript level . Negre et al. discovered that the biosynthesis of volatiles in P. x hybrida, exemplified by methyl benzoate, decreases 70 to 75 % after pollination (when the pollen tubes reach the ovary) . Nakamura et al. found that the common solid deep-blue cultivar of P. x hybrida (last photo) abundantly emit isoeugenol as the principal volatile . Where these flowers are plentiful in window boxes, the wonderful sweet spicy-floral fragrance of isoeugenol may be perceived from a considerable distance. 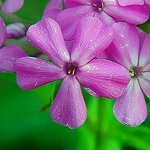 Phlox is a genus of some 60 species native to North America and Siberia. It is found in diverse habitats - from alpine tundra to open woodland and prairie. 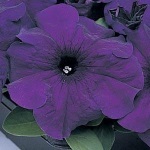 Several species are popular ornamental flowers and are cultured in many varieties/hybrids, e.g. garden phlox, Phlox paniculata, which flowers until late September. 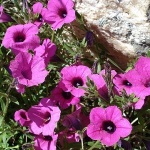 main constituents were, among others, lilac alcohol, eugenyl methyl ether, isoeugenyl methyl ether and germacrene-D .
To the author of these lines the flowers of garden phlox sometimes have a slightly curry-like note which is not accounted for by any of the above constituents (alone). Etymology: Gr. 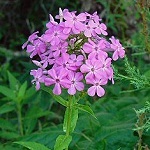 phlox, flame or torch, referring to the appearance of the flower buds. Lat. paniculata, flowers in panicles. 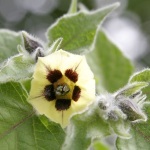 The genus Physalis of the nightshade family counts more than hundred species, most of them from the warmer parts of America. 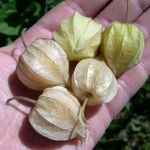 Physalis peruviana is a native of tropical South America, but is now grown worldwide. The fruit is a berry, resembling a small orange tomato (to which it is related). 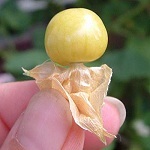 Upon ripening, the surrounding husk derived from the calyx becomes large and inflated, making the fruits look like paper lamps hanging from the plant. Physalis shrives in any greenhouse. Like most Solanaceans it grows fast and gives ample yield. Sniffing at a ripe berry immediately after having removed the husk reveals a warm flavour of caramellic sweetness, unmistakably indicating the presence of cyclic C6-alpha-enol-carbonyls. On chewing it, the fresh-sweet berry displays a charmingly complex flavour with notes in common with tomato, pineapple and gooseberry. Using GC-MS and sniffing gas chromatography of serially diluted flavour extracts, Berger et al. showed that methyl 2-methylbutanoate, 2,5-dimethyl-4-hydroxy-3[2H]-furanone (furaneol) and its methoxy analogue (mesifurane), 4- and 5-octanolide (gamma- and delta-octalactone), beta-ionone and beta-damascenone are flavour impact compounds .